A National Institutes of Health-supported nationwide clinical trial will test a novel approach to combat hearing loss in children infected by a relatively unknown virus, cytomegalovirus (CMV). The University of Utah Health-led study will determine whether antiviral therapy can halt progressive hearing loss in children with a confirmed CMV infection. CMV is the leading non-genetic cause of hearing loss, contributing from 6 to 30 percent of childhood cases. Each year, about 30,000 U.S. babies are born infected with CMV. Because the vast majority of newborns show no outward symptoms, infection typically goes undetected. Nevertheless, about 1 in 5 will develop long-term health problems, the most common being hearing loss. Other symptoms include vision impairment and brain abnormalities. "Zika is a huge issue globally but CMV, which also causes microcephaly, is actually a bigger problem in the United States," says Albert H. Park, M.D., lead investigator of the clinical trial, a professor at U of U Health, and a practicing pediatric otolaryngologist at Primary Children's in Salt Lake City. Unlike Zika which is transmitted by mosquitos, CMV is passed from person to person by contact with bodily fluids. Although the virus typically causes mild symptoms in children and adults, it can severely impact infants in utero. Each year, about 5,000 babies are born in the United States with permanent problems related to CMV infection. By comparison, 51 U.S. newborns had Zika-related birth defects last year. This study will specifically evaluate whether antiviral medication prevents CMV-caused hearing loss in newborns from getting worse. "More than half of children with CMV-induced hearing loss will lose more of their hearing over time," says Park. "The question we are addressing in our study is, if you identify these children early and treat them with an antiviral medication, valganciclovir, can you prevent further hearing loss?" Since 2014, three states Utah, Iowa and Connecticut have taken steps to address the health concern by passing legislation mandating that babies who fail the newborn hearing test be screened for the virus. It is recommended that babies are screened early because it is difficult to diagnose children older than 3 weeks of age. The Utah legislation was the first, and has proven to increase early identification of CMV-infected infants with hearing-loss. The new research broadens early CMV screening to 30 sites across the country and takes intervention a step further. Parents of CMV-infected, hearing impaired newborns will be asked to enroll their child in the randomized, double-blind study. Half will receive an antiviral medication and the other half placebo. Hearing will be monitored during treatment again at one and two years post-treatment. Health care providers will also examine speech, language and motor skills. "These tests are instrumental for measuring the trajectory of the children's communications abilities so they can receive the intervention they need," says co-investigator Sean Redmond, Ph.D., a professor of Communications Sciences and Disorders at U of U Health. He adds that results from testing will be used to evaluate whether the medications protect children from further damage and are safe. CMV screening and treatment has been a point of contention in recent years. Medical organizations have recommended against these measures mainly on the premise that to date, there is no treatment that has been rigorously tested in newborns, explains Park. This clinical trial aims to meet this need. The antiviral treatment itself, a drug called valaganciclovir, has been another subject of debate because it is largely untested in this patient group and has been associated with side effects including anemia and other hematologic toxicities, and impaired fertility. 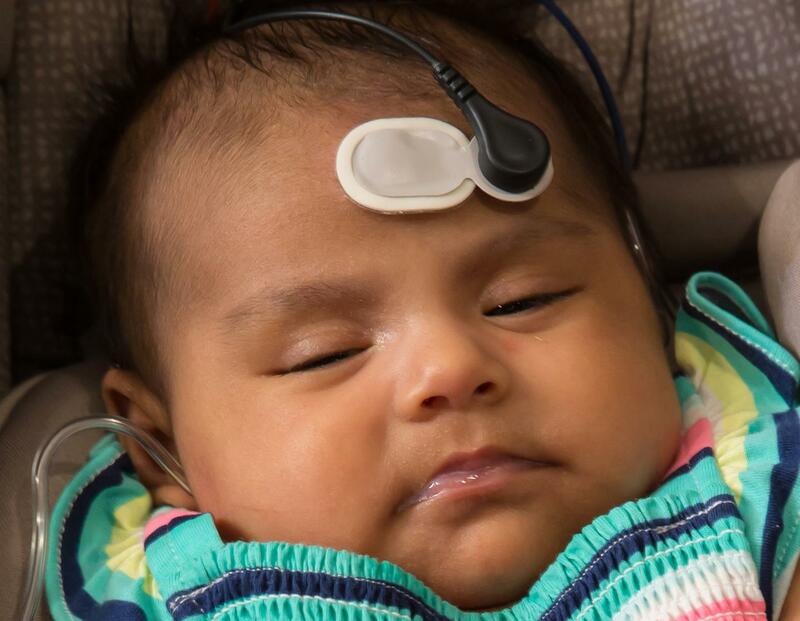 So far, one investigation found that treatment was relatively safe and modestly effective in improving hearing outcomes in newborns born with severe CMV symptoms, such as brain abnormalities. The current study extends treatment to CMV-infected newborns with the less the severe symptom of hearing loss only.